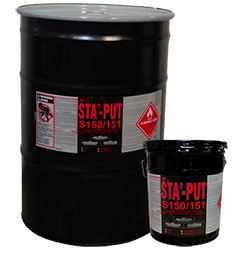 STA’-PUT® S150/S151 is a solvent-based, high solids contact adhesive excellent for postforming applications. S150/S151 has been specifically formulated for use in bonding a wide variety of materials including decorative laminate, steel, particle board and rigid plastics. S150/S151 offers ease of use, fast drying, excellent heat resistance and long open tack. This is the same formulation as Conbond 2466 the nationally known “Workhorse for Decades” that our customers have known and loved. One of our best-selling adhesives.